A elderly man is found in his home unconscious after his son was unable to contact him on the phone. As part of a neurological work up, funduscopy is performed. Q1. What does funduscopy show? Flame-shaped hemorrhages and yellow exudates appear near the disk margins as edema progresses. When observed in real time there may be obliteration of spontaneous venous pulsations (absent in 20% of normal people anyway). Q2. What symptoms are usually associated with this finding? Papilloedema itself is usually asymptomatic. There may be episodes of transient, often bilateral visual loss (lasting seconds), precipitated by rising from a lying or sitting position as a result of intracranial pressure changes. Otherwise the presentation reflects the underlying cause and symptoms of raised intracranial pressure (e.g. headache and vomiting, worse in the morning) may be present. Watch this RootAtlas video to see what spontaneous venous pulsations look like on funduscopy. Q4. What are the possible underlying causes of this condition? Atophy is a misnomer — it is not a result of disuse! Q6. 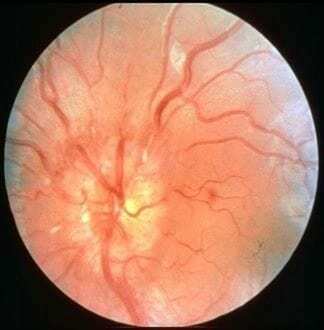 What is the key feature of this condition on fundoscopy? 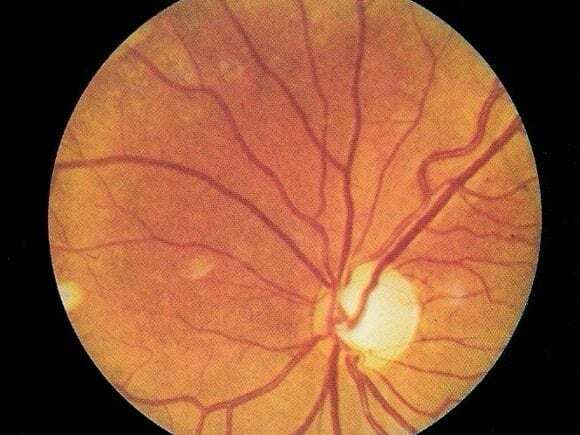 A pale insipid optic disc (loss of the normal yellowish colour), with absence of normal physiological cupping. Q7. What are the causes of this abnormality? surrounding nerve fiber layer is normal. spontaneous venous pulsations are usually present. 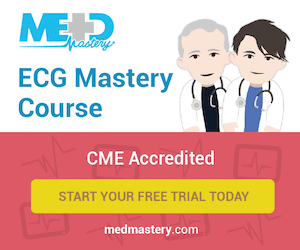 Further investigation may still be required to rule out raised intracranial pressure. Beck RW, Cleary PA, Trobe JD, Kaufman DI, Kupersmith MJ, Paty DW, Brown CH. The effect of corticosteroids for acute optic neuritis on the subsequent development of multiple sclerosis. The Optic Neuritis Study Group. N Engl J Med. 1993 Dec 9;329(24):1764-9. PMID: 8232485. The 5-year risk of MS after optic neuritis. Experience of the optic neuritis treatment trial. Optic Neuritis Study Group. Neurology. 1997 Nov;49(5):1404-13. PMID: 9371930. Sellebjerg F, Nielsen HS, Frederiksen JL, Olesen J. 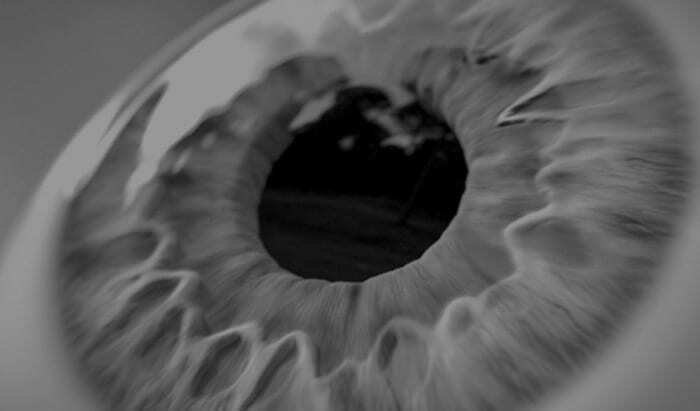 A randomized, controlled trial of oral high-dose methylprednisolone in acute optic neuritis. Neurology. 1999 Apr 22;52(7):1479-84. PMID: 10227638.